WADA’s independent Intelligence and Investigations (I&I) Department acquired new intelligence concerning the former WADA-accredited Moscow Laboratory. Specifically, the I&I Department is in possession of an electronic file that the Department is confident is the Laboratory Information Management System (LIMS) database of the Moscow Laboratory, i.e. all testing data between January 2012 – August 2015. In the meantime, WADA has briefed the International Olympic Committee’s (IOC’s) Schmid and Oswald Commissions regarding the situation; and, commits to reaching out to impacted Anti-Doping Organizations regarding this new intelligence, as well as other developments related to the McLaren Investigation, in a timely fashion. WADA’s independent Compliance Review Committee (CRC) considered this new intelligence, which will shape the recommendation that it intends to make to the Agency’s Foundation Board on 16 November regarding whether or not to declare the Russian Anti-Doping Agency (RUSADA) compliant with the World Anti-Doping Code (Code). WADA’s Board declared RUSADA non-compliant in November 2015, following revelations of widespread doping in Russian athletics that were exposed via WADA’s independent Pound Commission. Since then, the Agency has been working hard with RUSADA to build a robust and sustainable anti-doping program in Russia. 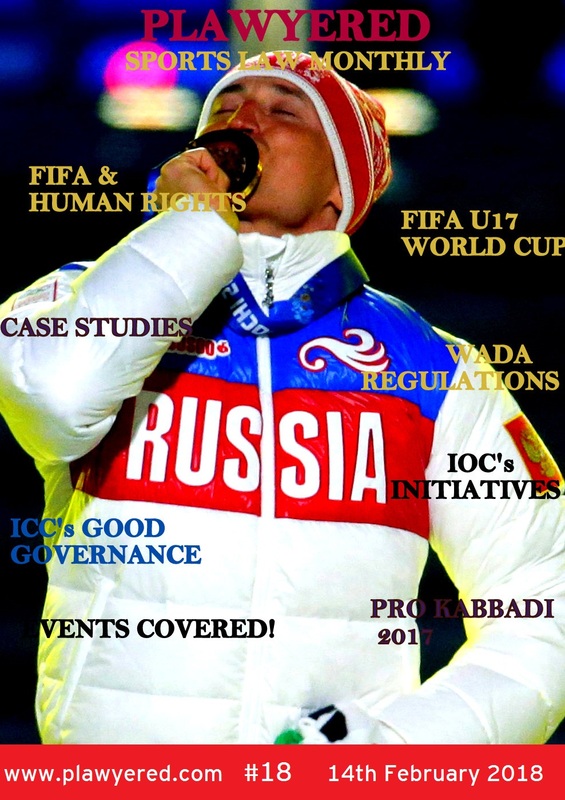 To that end, WADA agreed a Roadmap to Code Compliance, which outlines the reinstatement criteria that RUSADA must fulfill before WADA’s CRC would recommend, to WADA’s Board, that they be declared compliant again with the Code. Next Next post: BCCI charges Yusuf Pathan under Anti-Doping Rule Violation (Article 2.1) & How BCCI examines Anti-Doping Rule Violation?